Update: 08:00 We’ve just added some photos below. Several sources were reporting that filming for season 5 of LOST wrapped, but filming is still taking place and our good friend Ryan from Hawaii has informed us of some details on what is currently happening on set. I am placing the details behind a Are You Sure Button once again. According to Crissy and Kanahina, on location now, they’re recreating an L.A. street scene (La Brea and Santa Monica) with several cars with California plates. A woman is lying in the road and Sayid comes to her aide. Considering recent reveals about someone visiting both Locke and Sawyer at pivotal moments in their history, and possibly Sun and Jin at their wedding, I suspect the same is happening here. Apparently this is the scene when Nadia was killed. Thanks to Roxy for the Sawyer’s Funeral Scene Pics. She was also able to catch the eerie cleanup of Nadia’s death scene as you can see crews power washing the ground of the blood from the scene. 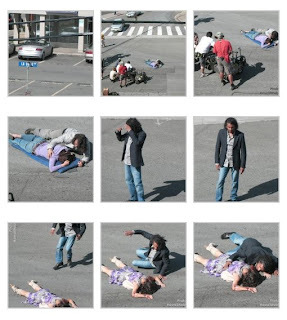 Here is a screencshot of all the great photos from the Nadia Death scene you can view at Hawaii Blog thanks to Ryan. Yes how is it all possible!? Well all I can report right now that they have confirmed Nadia is on set. Please stay tuned as filming is currently taking place because several different set reporters are on set and we will update as we get more information. Thanks to PHOTOlulu for the video of some recent filming of the Finale that we’ve mentioned in previous posts. You can’t see a great deal but I though I’d share anyway. Thanks to Tia Rose for heads up on what looks like some new casting of young Rachel. Thanks to my team on the set we have a couple of minor snippets. This week we have seen all sorts of spoilers and tidbits for the Season 5 LOST Finale revealed. Many of the tidbits have been MAJOR reveals and we have been placing them behind “Are you Sure Buttons” just to play it safe. Here is one more small tidbit from our source The Observ3r. Jacob did not interact very long with Young Sawyer but did act as a type of conscious saying something about “I know what you did”. As first reported by TVGuide.com, Lost executive producers Damon Lindelof and Carlton Cuse decided this year to invite fans to come up with the “code name” for the season finale’s jaw-dropping simpulan moment. One of the above — “The Hooded Leprechaun” — the boys say, seems “oddly appropriate,” given the actual nature of this season’s top-secret simpulan scene. Darlton and Cuse will further whittle down the list each week via their ABC podcast. In the meantime, TVGuide.com is here to tell you what this year’s “Frozen Donkey Wheel” will not be nicknamed. In this “bonus” episode of our Getting Lost video series, the producers reveal the No. 1 Rejected Code Name — god-awful misspellings and all. Now if I may brazenly stir the pot, is it that the “worst” suggestion is that bad … or perhaps Darlton’s “problem” with it is that it’s far, far too accurate and thus spoilery? A-ha! Here is the official ABC Press Release for Episode 5.13 – Some Like It Hoth that we leaked a while ago. “Some Like It Hoth” – Suspicions about a possible breach intensify after Ben is taken from the infirmary, and a reluctant Miles is forced to work with Hurley when he’s asked to deliver an important package to a top Dharma official, on “Lost,” WEDNESDAY, APRIL 15 (9:00-10:02 p.m., ET) on the ABC Television Network. “Lost” stars Naveen Andrews as Sayid, Henry Ian Cusick as Desmond, Jeremy Davies as Daniel Faraday, Michael Emerson as Ben, Matthew Fox as Jack, Jorge Garcia as Hurley, Josh Holloway as Sawyer, Yunjin Kim as Sun, Ken Leung as Miles, Evangeline Lilly as Kate, Elizabeth Mitchell as Juliet and Terry O’Quinn as Locke. Guest starring are Francois Chau as Dr. Pierre Chang, Marsha Thomason as Naomi Dorrit, Doug Hutchison as Horace Goodspeed, Patrick Fischler as Phil, Jon Gries as Roger Linus, Eric Lange as Radzinsky, Leslie Ishii as Lara, Brad William Henke as Bram, Dean Norris as Howard Gray, Tim DeZarn as Trevor, Lance Ho as young Miles and Linda Rose Herman as Evelyn. “Some Like It Hoth” was written by Melinda Hsu Taylor & Greggory Nations and directed by Jack Bender. Thanks to a DarkUFO reader for sending the following in. I was browsing flickr and found some pictures of Elizabeth Mitchell boarding the USS Bowfin. There are also 2 pictures of Richard on the beach. The pictures were taken on March 13th, 2009. The quality of the pictures is not the best because they were taken from a long distance, I believe. Update: 10:20 I’ve updated the sneak peeks to use a High Quality. Here are three sneak peeks for this week’s LOST Episode 5.11 Whatever Happened Happened. Update: 10:00 I’ve been getting a lot of comments and emails about this death. So I thought I’d make post here. I am assuming that this death Kristin is referring to is different Bandar Ceme to the death poll etc that we ran a while ago. The death poll is for an earlier episode so it looks like this is a new death. Update: 09:40 In Kristin’s original post she had the following question. This was then deleted for some reason? Marcus in Pittsburgh: Can we get one decent clue about the Lost death? Charlie Pace and the major character that dies this season are polar opposites in at least one key physical attribute. Here is what Kristin from E! Online had to add from LOST Writer Eddy Kitsis who confirmed indeed the death is a Charlie-like character death and that the writers had doubts about the death as well. Melanie in Auckland, New Zealand: Lost scoop, please, hopefully about which character is dying. We hit a Lost writers event last week at the Writers Guild Foundation in Beverly Hills, and when asked about character deaths, awesome Lost exec producer Eddy Kitsis told the audience, “We arc out characters, so we know who will die and when they die. I will say when it comes to those episodes, sometimes it’s very hard to let go, and you’ll start saying [in the writers’ room], ‘I know we planned all season for Charlie to die, but…what if he didn’t? Maybe Charlie lives.’ And that’s how we know how it’s good—because if we’re having this emotional reaction over losing these characters, hopefully you will, too.” For the record, we will have a Charlie’s-death-level emotional reaction to the character death at the end of season—there will be wailing, rending of garments and general grief. The writers probably had plenty of doubts about whether or not it was really a good idea to kill this particular character.